This Peace Park will commemorate the war dead, friend and foe alike, from Danshui's past. News reports on March 22 show that the 1000-year old 長命穴Longevity Cave - one pass adds three years to your life - has collapsed. On March 11, at 2:47PM local time, Japan is struck by the largest recorded earthquake in its history off the coast of the northeastern city of Sendai [9.0 on the Richter scale]. It surpasses the previously largest 宝永地震 in 1707 [Magnitude 8.6]. 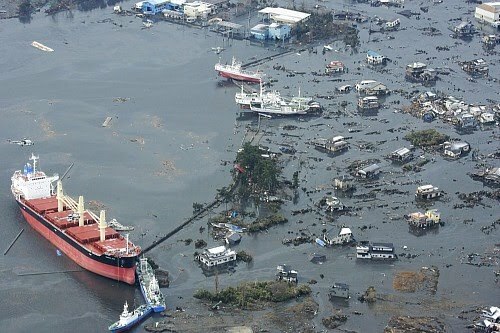 Minutes later, the coastal areas were devastated by a huge tsunami津波. 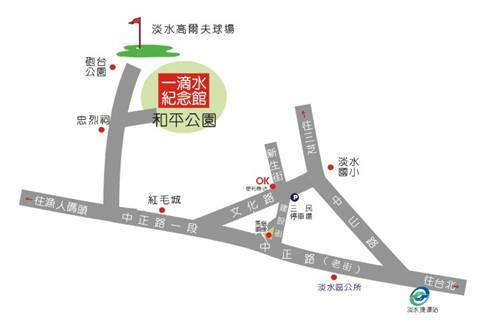 The same epicenter has acted up before, in 869AD [貞観11年] [see the red rectangle in the diagram above]. The tsunami had also left markings in the inland areas. Matsushima松島, near 仙台市Sendai City, in Miyagi-ken, is one of the three major sights in Japan. Legend has it that the well-traveled poet Matsuo Basho [松尾芭蕉, 1644 – November 28, 1694] was at loss for words, totally captured by its beauty when he first visited it. He left behind an unfinished haiku: Matsushima ya aaa Matsushima ya Matsushima ya松島や ああ松島や 松島や. 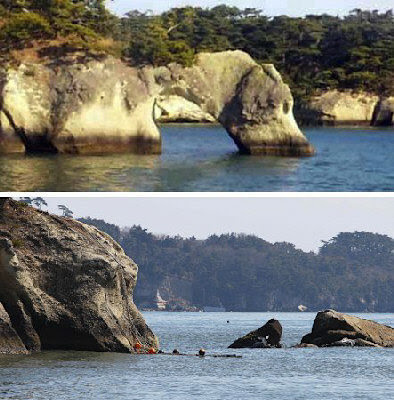 Unfortunately, the short Togetsu Bridge渡月橋 linking Oshima雄島 has now vanished; the 252-m red bridge to 福浦島Fukuura Island - the Fukuura Bridge福浦橋 above - is most likely also damaged. And 瑞巌寺Zui-gan-ji, a national treasure built in 1604-9 by Lord Date Masamune伊達政宗, has been turned into a temporary shelter for some 300 stranded tourists who were later evacuated to Sendai. The temple itself sustained some minor damages. The entry way to the temple is covered by mud, however. 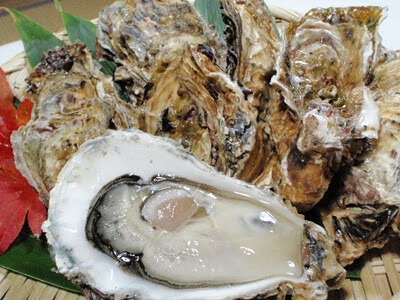 The counterpart of the tastiest oyster that has long disappeared from Danshui can still be found in Matsushima; although after the tsunami, the fate of the famed 松島牡蠣Matsushima kaki, cultivated in the bay remains unclear; the exports seem to have stopped for now. This natural disaster has wreaked havoc in the northeast Japan where entire villages and towns were claimed by the sea. The Fukushima power plant nuclear reactors are still out of control. With 50 heroic workers on the job, that too will end soon, one way or the other. The journey of recovery will be a long and hard one; yet fully recover it certainly will. 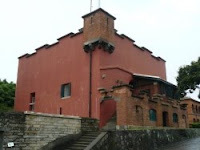 Visitors to the Ft San Domingo紅毛城 in Danshui will know that it was initially built by the Spaniards in 1628. 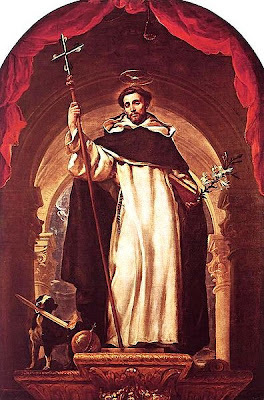 The name was in honor of Saint Dominic, founder of the Friars Preachers [the Order of Preachers (OP)], commonly known as the Dominicans. It was later re-built by the Dutch (finishing in 1646) and re-named Ft Anthonio. The fortress was subsequently repaired and occasionally maintained throughout the Ming-Cheng dynasty and the Qing era. The Brits then leased it from the Qing in perpetuity in 1867/8 and the original name in Spanish was officially retained. To the locals, however, the fortress is always the 紅毛城 [literally City of the Red-haired]. 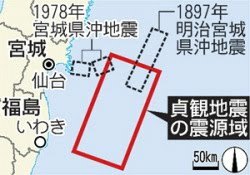 On Aug 21, 1642, the Dutch, after an unsuccessful try one year earlier, attacked the Spanish stronghold Ft San Salvador [located on Palm Island or 社寮島, now 和平島] in Keelung again with 690 soldiers on board of 5 galleons and 2 junks. The Spaniards capitulated after 5 days of intense fighting. Keelung was then ruled by Colonial Governor Hendric Harconse and its garrison commanded by Lt Kriec Kenheecq. The Dutch fortified Ft San Salvador and christened it Ft Noort Hollant [North Holland]. Soon after, 50 soldiers were left to guard the fortress with another 80 dispatched to occupy Danshui. In Feb, 1644, in an attempt to conquer the Senar Tribe in Danshui [in the area now 中興里 and 鄧公里] and other Aboriginal tribes in the region, Lt Kenheecq staged a show of force that, however, had backfired resulting in the loss of 21 Dutch soldiers and 49 Han and Aboriginal mercenaries. Kenheecq was replaced by Captain Pieter Boon who arrived from Tayouan [Tainan] with construction materials and laborers to reinforce Ft Anthonio. This was quickly aided by the arrival of 7 war ships with 300 Dutch soldiers and 10 Han mercenaries on board. And after two months of battles, except the Senar tribe, most other tribes in Danshui, Keelung and Ilan submitted to the Dutch rule and were forced to pay enormous annual tributes. In 1661, Koxinga succeeded in driving out the Dutch from Taiwan; the latter, however, had never accepted the defeat. In 1664, they actually returned to the undefended Keelung to re-build the fortress, arm it with 24 guns, and guard it with 240 men. In 1665, Cheng Jing鄭經 (1642-81), Koxinga's son and heir, sent a naval force from Tainan to take Keelung. The Dutch responded by increasing the defense stationed in Ft North Holland (to 387 men by 1667). However, with the trade with Foochow cut off by the Qing, the hostility of the locals owing to years of ruthless Dutch rule, and the difficulties in re-supplying from Batavia, the Dutch finally gave up and retreated to their home base in Indonesia in Oct, 1668. Min-Cheng General Huang-An黃安 led a joint navy-army force to Danshui and took over Ft Anthonio. 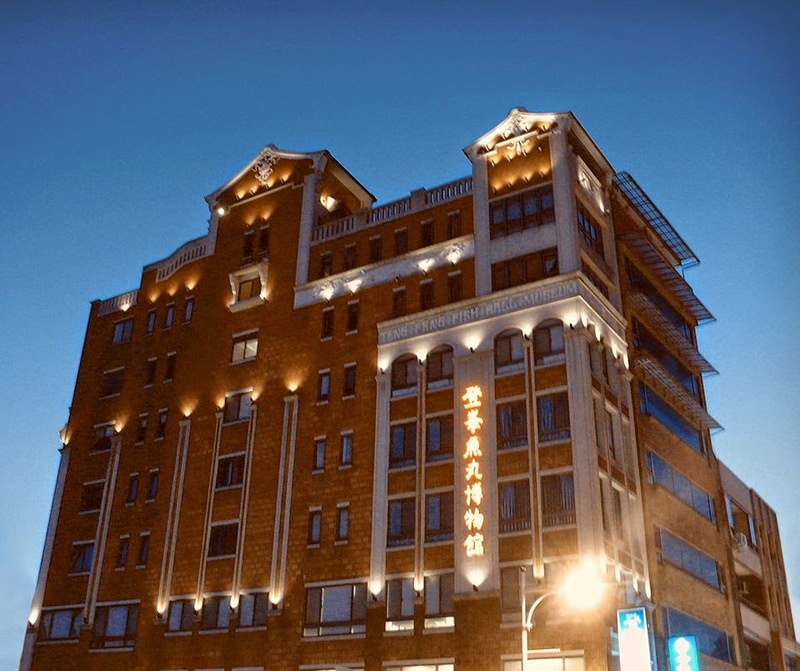 The presence of the Dutch in Danshui/Taiwan finally came to an end. By 1669, the whole northern Taiwan came under the control of the Tung-Ning Kingdom. In 1681, Ming-Cheng General He-You何祐, based on 紅毛城, was charged with the defense of Keelung and Danshui who, in the end, yielded the command to the Qing in 1683. Danshui then became increasingly dominated by Han immigrants arriving mostly from Hokkien. The original name of this temple is 鄭成功祖廟Koxinga's Ancestral Shrine (see the plaque under the eaves in the structure below). It was built by Koxinga's son 鄭經Cheng Jing in 1663. In other words, it only accommodates the Koxinga branch of the Cheng Family. There are no other temples honoring Koxinga's brothers. This temple is now extended to include all Cheng's regardless of their ancestral link - whether it was with Koxinga or his father Cheng Zhi-lung or even no links at all, hence the 鄭氏家廟 designation. A world congress will be held on Nov 6, 2011. All Cheng's are welcome!